If you have ever wanted a subtle way to rock the leopard print trend , well then these jeans are for you. They are by Current/Elliot and cost €250 from farfetch.com. 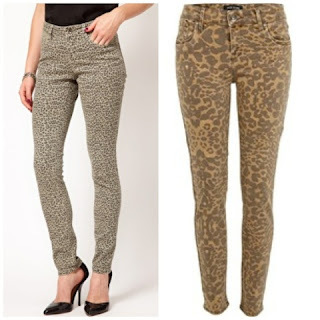 The jeans come in many colours but the most neutral ones are the grey ones or the classic leopard colours. These leopard jeans could be dressed up or down. During the day they can be worn with a block colour tee and then dressed up for evening wear with a classy blazer. Although I love these jeans, €250 would be stretching my budget. I then went searching for an alternative. The jeans on the left are from asos for €32 and the jeans on the left are €43 from riverisland. It seems I'm not the only one in love with these jeans as dozens of celebs have been spotted rocking these jeans.